S. China Sea claims and the ASEAN Economic Community were key issues at the recent ASEAN summit. At the latest summit of the Association of South East Asian Nations (ASEAN) in Brunei leaders provided a refreshing change to the infighting and bickering which characterized the 12 months since April 2012 when Cambodia – with some dabbling from China – was host. Divisions remained, however, and agreements on touchy subjects like how to handle overlapping claims and best deal with Beijing in the South China Sea were as elusive as ever. Beijing could not resist having another shot at The Philippines, issuing a critical statement on Manila’s push for an international verdict on disputed islands and demanding the withdrawal of all personnel and closure of facilities from islands that it said Manila was occupying. According to Philippine Foreign Secretary Albert del Rosario, ASEAN is ready to deal with China as a bloc on the issue. However, China wants bilateral negotiations with ASEAN members only and refuses to have the dispute heard in an international court. “I think the next step belongs to China,” del Rosario said at a post ASEAN briefing. Despite the territorial disputes, trade between ASEAN countries and China continues to boom and in Southeast Asia’s favor with Beijing running a trade deficit of $23 billion in 2012, up 37 percent from the previous year. This in itself is putting pressure on ASEAN leaders to find a peaceful solution to the diplomatic and sometimes military standoffs in the South China Sea. Once again, there was little insight offered on what shape the ASEAN Economic Community (AEC) might take once it is launched at the end of 2015, although talk of seamless trade among the ten members and their trading partners gave some meaningful food for thought. Whatever shape the AEC ultimately takes, it is becoming increasingly obvious that the group will belong to big business leaders with the right political connections who can take advantage of removing tariffs and laws that impede cross-border traffic. Leaders insisted the launch of the AEC was on schedule with 77 percent of the work now done. They declared that May 9 will be the start date for negotiations on a vast free trade area with key partners China, India, Japan, Australia and New Zealand. There was also push towards admitting East Timor as the trading bloc’s 11th member, although ASEAN Secretary General Le Luong Minh indicated this is still some time off. By Summit’s end the relief was palpable that ASEAN had managed to avoid a repeat of last year’s public squabbling and put on a business-like performance with a unified front to the 600 million people who make up the bloc. If nothing else, this must give organizers something to smile about. 2013 promises to be a decisive year for Southeast Asia. 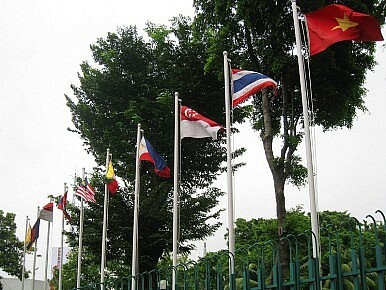 Will ASEAN unite? Will reforms in Myanmar continue?